Today’s my Mom’s birthday. She would have been 64. On my 16th birthday, my Mom gave me a dozen yellow roses. I don’t know why, exactly, but I do know that they were yellow because that was my favorite color at the time. She gave me (or sent me) yellow roses on my birthday every year thereafter, except last year, and I kind of understood why. The other day, my friend Amy and I were out riding bikes and we stopped at a garden nursery to take a break. Amy spotted some rose bushes on sale. 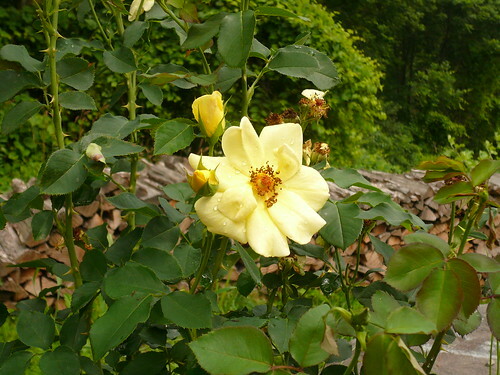 Yellow roses. Amy said she’d been thinking about planting a yellow rose bush for awhile, so she thought she might come back later with a car and buy a bush. We both ended up getting one. And today I planted mine in my new front garden, so every summer I’ll have yellow roses blooming, maybe not for my birthday, but certainly for Mom’s. Happy birthday Mom. I’m thinking of you.